Set amongst the lush indigenous gardens of Misty Hills Country Hotel, the new conference venues provide a relaxed, yet professional environment, conveniently located thirty minutes from Sandton and 15 minutes from Lanseria Airport. The nine air-conditioned conference venues include, Leopard, Lion, Cheetah, Caracal, Civet, Honeybadger, Hyena 1, Hyena 2, and Lynx. Delegates are served lunch at a custom built buffet area. A variety of domestic and game meats - all unique to the African continent will be offered. Soup of the day, a variety of salads and sauces, baked potatoes, pap & sauce and a delightful assortment of desserts are included. Vegetarian options also available. 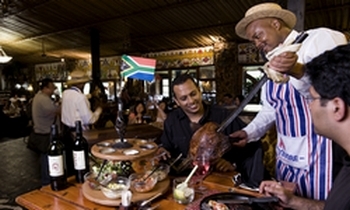 Carnivore is truly 'Africa's Greatest Eating Experience'.